← Capt. 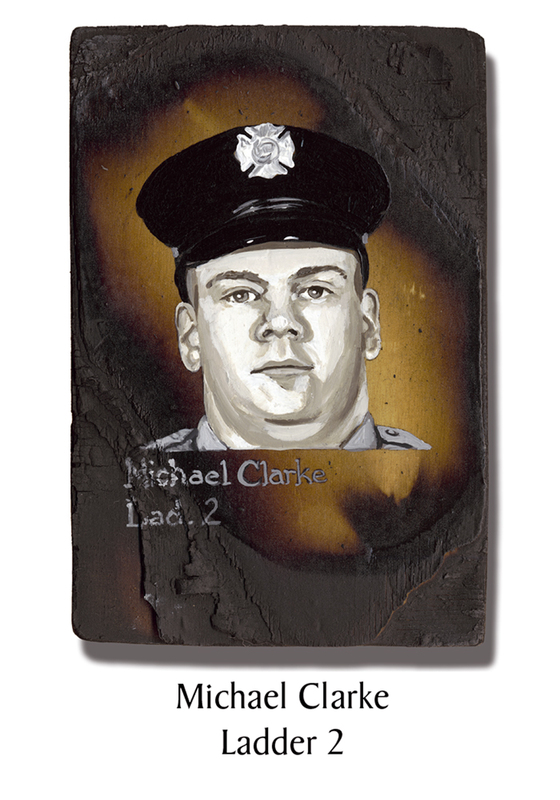 Frederick Ill, Jr.
Michael Clarke, 27, was the son of a NYPD officer but he always wanted to be a firefighter. As a toddler his dad gave him one of those little red engines to peddle around. On the force since 1998, he was pleased when transferred from Staten Island to Ladder 2 “because there was so much more action in Manhattan.” September 11th had been a scheduled day off, but he had switched shifts with another firefighter. This entry was posted in Better Angels Stories and tagged 343, 9/11, better angels, Dawn Siebel, FDNY, firefighter, firefighters, firefighters of 9/11, Ladder Co. 2, LODD, Manhattan, memorial, Michael Clarke, NFFF, paintings, portraits, World Trade Center, WTC. Bookmark the permalink.